Bharti Airtel has made a much-needed revision to its popular Rs. 349 tariff plan for prepaid users. Airtel earlier this year launched the Rs. 349 plan exclusively for its prepaid users to counter Reliance Jio’s tariff plan. All these days, the plan offered unlimited local and STD voice calls along with 1GB data per day for 28 days. However, Airtel has revised the plan now and it now offers unlimited free outgoing roaming calls as well. Another best part of this revision is that the Rs. 349 plan now offers 100 SMS per day for 28 days. That said, Airtel made this change to get an upper hand in the market and especially to compete with Reliance Jio directly. 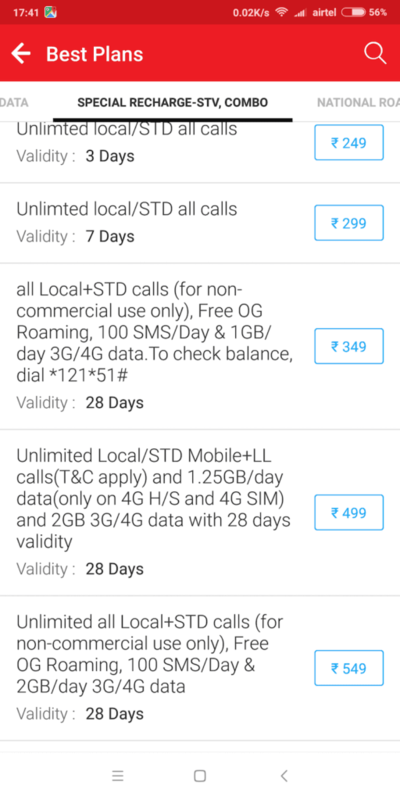 Until now, Airtel limited the voice calls to just home circle and the company used to charge outgoing roaming calls as per normal circle rates. In contrast, Reliance Jio offers unlimited incoming and outgoing roaming calls without any daily cap which gave the operator an upper hand. Also, Airtel hit the right spot by changing the plan to offer 100 SMS per day for 28 days. Having said that, Airtel also modified all its unlimited plans such as Rs. 549, Rs. 499, and Rs. 399 as well. Airtel is still offering the Rs. 399 plan for some users which gives benefits such as 1GB 3G/4G data per day, unlimited local and national voice calls, 100 SMS per day for 70 days, and for some users, the same plan is valid for 84 days. The Rs. 599 and Rs. 799 plans from Airtel also gives unlimited voice calls (both local and national calls), 100 SMS per day for 28 days. The Rs. 599 gives 2GB data per day, while the Rs. 799 plan gives 3GB data per day for 28 days. Reliance Jio has a Rs. 309 plan that also offers unlimited voice calls, 1GB data per day and unlimited SMS for 49 days. Airtel is making these moves to retain its subscriber base. Airtel always hides information to share with customers. Here in This plan, SMS is chargeable in Roaming. So why we need to go for airtel. Now i use jio as its good network always lets me connect with my family and friends even when I am travelling. Additionally THERE IS NO CHARGE FOR VOICE,DATA,SMS,CALLER TUNE. Airtel is too late in doing anything. They should have announced all roaming calls free at least 3 months back only. Because of roaming charges only I ported to Jio and happily using it since last 3 months. Sorry airtel I also ported to jio.